During the transition to a lower-carbon world, different transport fuels will coexist. Shell is investing in biofuels, which can be blended with existing fuels such as petrol and diesel. When used in vehicles, they can be a cost-effective way of reducing CO2 emissions. 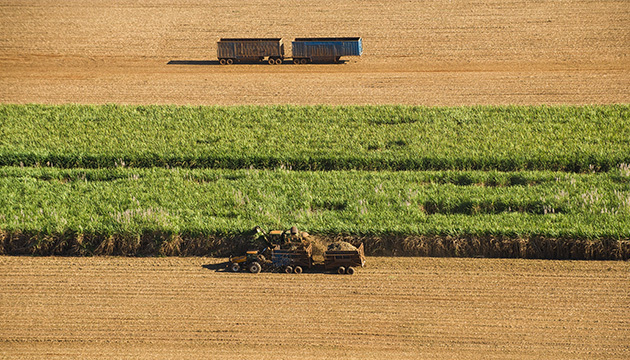 Sugar-cane ethanol in Brazil, for example, can reduce CO2 emissions by around 70% compared with conventional petrol, from cultivation of the sugar cane to using the ethanol as fuel. Shell is one of the largest blenders and distributors of biofuels. In 2018, we used around 9.5 billion litres of biofuels in the petrol and diesel we sold worldwide in order to meet specific regulations. Raízen, our joint venture in Brazil (Shell interest 50%), produces ethanol from sugar cane, with an annual production capacity of more than 2 billion litres. In addition to understanding blended biofuel emissions, we want to ensure that other environmental impacts from biofuel production are well managed – such as the effect on soil, air and water – and that there are benefits for the livelihoods of local communities. Read more on our approach to biofuels at www.shell.com/biofuels. When purchasing biofuels, we require that they are produced in a way that is environmentally and socially responsible. Where possible, we source biofuels that have been certified against internationally recognised sustainability standards. We support the adoption of international sustainability standards including the Round Table on Responsible Soy (RTRS), the Roundtable for Sustainable Palm Oil (RSPO) and Bonsucro, an organisation for the certification of sugar cane. We also support the Roundtable for Sustainable Biomaterials and the International Sustainability and Carbon Certification (ISCC) for feedstocks. Shell aims to have 100% of the sugar-cane ethanol and South American soy biodiesel used in Shell-blended or traded biofuels certified as sustainable by 2020. In 2018, 60% was certified as sustainable. All the palm oil that we blend is certified by RSPO or the ISCC or covered by offsets from the RSPO certificate trading system. We continue to participate in the RSPO and support its latest set of standards for sustainable palm oil production adopted in 2018. In the Philippines, coconut oil is the primary feedstock for biodiesel. In 2018, Pilipinas Shell announced the launch of a sustainability project with coconut farmers in collaboration with JNJ, one of our major suppliers of coconut methyl ester. The project will help train farmers in more sustainable farming practices, which can also enable them to improve yields and increase their income. [A] Does not include purchases by Raízen. [B] Percentages do not add up to 100% due to rounding. Raízen, our joint venture in Brazil (Shell interest 50%), produces ethanol from sugar cane, with an annual production capacity of more than 2 billion litres; exports sugar, with an annual production of about 4.2 million tonnes; and manages a retail network. Raízen opened its first cellulosic ethanol plant at its Costa Pinto mill in Brazil in 2015. When fully operational, the plant is expected to produce around 40 million litres a year of advanced biofuels from sugar-cane residues. Our joint venture in Brazil, Raízen, produces ethanol from suger cane. Through Raízen, we produce one of the lowest CO2 biofuels available today. Around 42% of Raízen’s ethanol and 45% of its sugar production were certified as sustainable to the standards set by Bonsucro. Raízen alone accounts for 39% of the world´s Bonsucro-certified sugar cane. By the end of 2018, 21 of its 26 mills were certified. Raízen purchases around half of the sugar cane it uses as a raw material from independent suppliers. Since 2014, the company has worked with two non-governmental organisations, Imaflora and Solidaridad, on a programme to help its suppliers become more sustainable. Based on volumes, the programme covered 96% of third-party sugar cane in 2018. 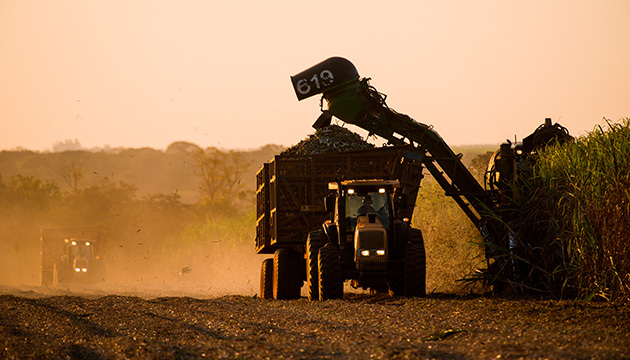 With 1 gigawatt of installed power capacity, Raízen is also Brazil's largest producer of electricity from biomass – straw and bagasse – which are by-products of ethanol and sugar cane production. 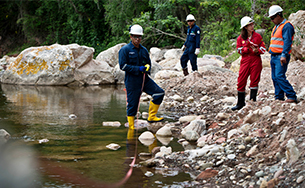 For more details, see Raízen’s sustainability report. We continue to invest in new ways to produce advanced biofuels from sustainable raw materials, such as waste and cellulosic biomass from non-food plants. We have a demonstration plant at the Shell Technology Centre Bangalore, India, which features an advanced biofuel process called IH2, a technology that can turn waste into transport fuel. The plant can process around five tonnes a day of feedstock, such as agricultural waste, and aims to demonstrate the technology for possible scaling up and commercialisation. In August 2018, we announced plans to expand and upgrade the JC-Biomethane plant in Junction City, Oregon, USA, which we acquired in May 2018. The plant transforms organic waste into renewable natural gas through a process called anaerobic digestion. Once upgraded, the facility is expected to produce up to 700,000 British thermal units of gas a year. In the UK, we are working with renewable fuels company Velocys and British Airways to develop and install a waste-to-renewable jet fuel plant. If installed, the plant would use post-recycled waste, destined for landfill or incineration, and convert it into cleaner-burning fuels. We are exploring long-term opportunities for lower-carbon fuels in aviation. 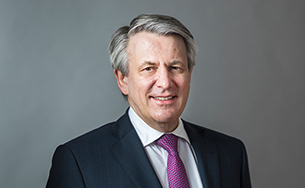 In 2018, Shell Aviation (Shell International Petroleum Co. Ltd) and SkyNRG announced a long-term strategic collaboration to promote and develop the use of more sustainable fuel in aviation supply chains. SkyNRG blends and distributes sustainable aviation fuel as well as developing regional supply chains. In November 2018, Shell Aviation and SkyNRG initiated the supply of sustainable aviation fuel to KLM, Scandinavian Airlines and Finnair at San Francisco Airport. The initial phase of the arrangement aims to pave the way for longer term, more resilient supply chains for sustainable aviation fuels and reduce the carbon emissions of flights from San Francisco and other airports. The fuel is produced by World Energy, currently the world’s only sustainable aviation fuel refinery. The fuel sourced by SkyNRG from World Energy’s Paramount refinery in Los Angeles is made from used cooking oil, resulting in a fuel that has significantly lower life-cycle carbon emissions than conventional jet fuel. 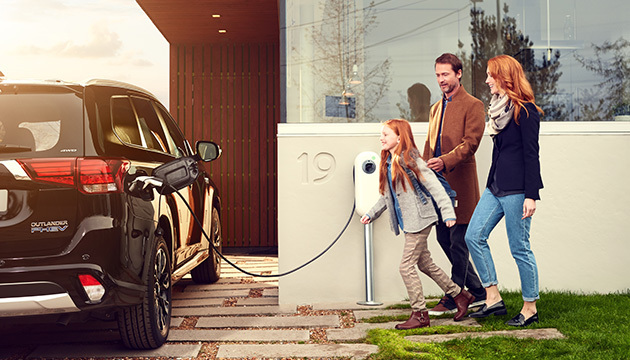 We are exploring how best to serve an increasing number of electric vehicle drivers, both in and beyond our forecourts. We want to ensure that customers can choose from a range of recharging options over the coming decades. By 2030, there could be 125 million electric vehicles on the road according to the International Energy Agency's New Policies Scenario, compared to around 3 million today. An adequate recharging infrastructure needs to be developed, to ensure customers can charge their vehicles and continue their journeys smoothly. Vehicle charging networks are a relatively new area for Shell. In 2017, we acquired NewMotion, one of Europe’s largest charging providers, which operates more than 40,000 private electric charge points in the Netherlands, Germany, France and the UK. NewMotion also has more than 80,000 public charge points across 28 countries in Europe and is developing solutions to provide customers with the flexibility to charge their vehicles at home and at work. Shell is working to meet the charging needs of electric vehicle drivers – at home, at work or on the road. We also offer electric vehicle fast-charging, a service called Shell Recharge, which takes around 30 minutes, at forecourts in the UK, the Netherlands and China. And we are working with high-powered charging network operator IONITY to offer even faster charge points in 10 European countries. In 2018, Shell Ventures invested in electric car-charging company Ample. Ample has used autonomous robotics and smart battery technology to develop an economical, rapidly deployable and widely accessible platform that delivers a full charge to any electric car in minutes. Shell Foundation has provided support to start-up business Aceleron which is exploring, among other things, how to use waste car batteries in the off-grid sector as storage or a power source. After being taken off the road, these batteries could reportedly have another seven to 10 years of useful life. Read more about Aceleron at www.shell.com/aceleron. In 2018, we launched a Formula E partnership with Nissan, which will help us to further research and develop ways to improve the driving experience for electric vehicle drivers. 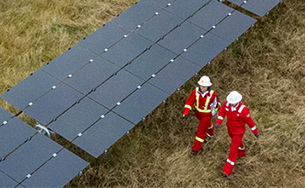 As the number of electric vehicles on the road grows, Shell is also working to provide more electricity from sources such as wind and solar power that will allow them to run on low-carbon power sources. Read more about electric mobility at Shell at www.shell.com/electricmobility. Wilson Smith, from the Department of Chemical Engineering at Delft University of Technology, has been working with Shell on how microscopic phenomena can be best harnessed in various industrial processes. 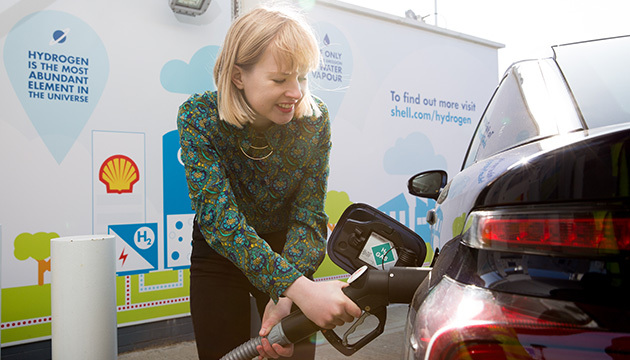 Hydrogen has great potential to help meet growing demand for transport, while reducing emissions and improving air quality. We are helping to build the infrastructure that will be needed if it is to realise this potential. Hydrogen fuel cell vehicles produce no greenhouse gases from their exhaust pipe – the only emission is water vapour. Taking into account factors from production to distribution, if the hydrogen is produced using renewable energy, then the fuel for these vehicles is virtually emission-free. Hydrogen cars could play a key role in the future of transport. Hydrogen is also an option in parts of the transport sector where other low-carbon alternatives are not suitable or where technology has been slower to develop. The high energy density of hydrogen makes it particularly suitable for transport that carries heavy goods over long distances, such as trucks. Read more about hydrogen as a transport fuel in A drive for cleaner air at www.shell.com/inside-energy. In Germany, through our participation in the H2 Mobility Germany joint venture, we are working with the government to develop a national network of around 400 hydrogen-electric fuelling stations across the country by 2023 – with 54 currently open, 20 of which are located at Shell retail sites. We are working on this project with our joint-venture partners French gas supplier Air Liquide, German car manufacturer Daimler, Austrian oil and gas company OMV, German engineering firm Linde and French oil and gas company Total. In 2018, we opened the first retail hydrogen fuelling station in Vancouver, Canada, and our third in California, USA. As part of a consortium led by the Port of Los Angeles to develop the first hydrogen refuelling network for trucks in California, we will also develop three new large capacity heavy-duty hydrogen truck refuelling stations. One of these will produce hydrogen from 100% renewable biogas. 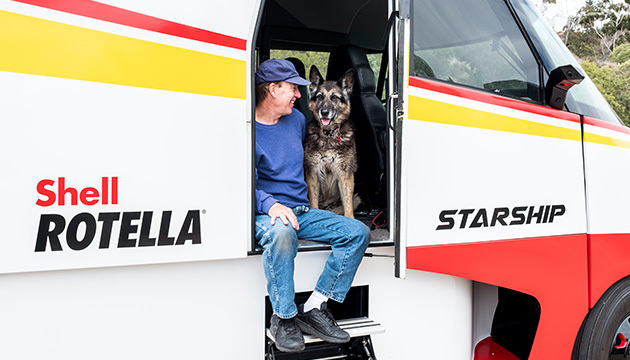 Together, they are being designed to support a fleet of 12 trucks each day. We are also assessing the potential for similar projects in other parts of the USA as well as in Belgium, France, Luxembourg, the Netherlands, Switzerland, the UK and China. Hydrogen also has many possible applications beyond the transport sector as a versatile and clean energy carrier. For example, it has a role to play in reducing emissions as a fuel for power plants and as a feedstock for industry, as well as to store energy for longer and at much greater scale than is currently possible with rechargeable batteries. In 2018, Shell started building an electrolyser, the largest of its kind, to produce hydrogen from water for our Rhineland refinery in Germany. We are also working with our partners to build and operate the world’s first liquid hydrogen ship, which will deliver hydrogen to international markets. In heating, a difficult sector to decarbonise, alongside efforts to improve energy efficiency, there is a role for hydrogen to be blended into the gas grid. Energy efficiency can deliver up to 35% of what is needed to keep global warming below two degrees Celsius by 2050, according to the International Energy Agency. Today, we serve more than 30 million customers every day at 44,000 Shell-branded service stations and by 2025 we plan for 40 million customers daily at 55,000 stations. We offer customers products that can help boost the efficiency of their engines by burning fuels more cleanly and reducing friction and wear. We also supply lower-carbon fuels such as liquefied natural gas, compressed natural gas, liquefied petroleum gas and hydrogen, along with electric vehicle charging points. Shell PurePlus Technology converts natural gas into a pure base oil – which can form up to 90% of a finished motor oil – to improve and protect an engine’s performance. For example, the technology is used in the Shell Helix 0W range of lubricants and can help to reduce CO2 emissions from a car’s operation by up to 3%. The Shell Advance motorcycle oil range, which also uses the technology, can minimise the build-up of engine deposits, allowing for more efficient power transmission. This can lead to better fuel economy, with some motorcycles travelling up to five kilometres more per litre of fuel. For heavy transport journeys, we helped pioneer a new vehicle to show how trucks can be more fuel efficient. We collaborated with AirFlow Truck Company to build and test a hyper-efficient concept truck. The Starship Initiative truck explores what is possible in truck design, fuel economy and CO2 reduction. On completion of a trial drive in the USA from the east coast to the west coast, the truck recorded a 248% improvement in freight tonne efficiency compared to the average North American truck. If all 2 million trucks in the USA reached the overall fuel economy and freight tonne efficiency performance of the Starship Initiative, they would emit an estimated 229 million tonnes of CO2 less each year. 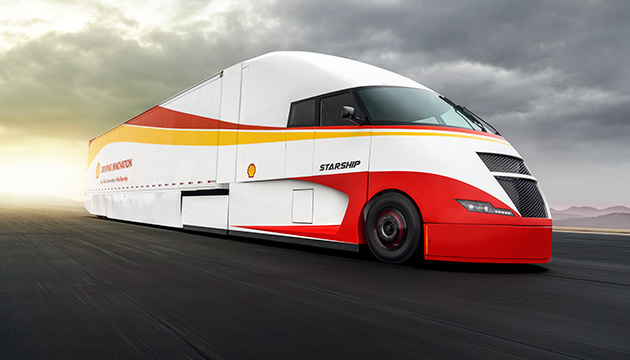 Starship is designed to show how trucks can be more fuel efficient. The Starship truck recorded a 248% improvement in freight tonne efficiency on its trial drive. We are actively seeking to make road surfaces smarter and the products used in their construction, such as bitumen, more energy efficient and cleaner. Using our clear bitumen in a light coloured asphalt, for example, we can reduce the need for lighting in tunnels by up to 40% without affecting driver visibility. We are also helping to ensure the efficiency of wind power through products and digital services so that its contribution to the energy mix can continue to grow.